Boulder City Animal Shelter This little guy came to the shelter after his owner died. 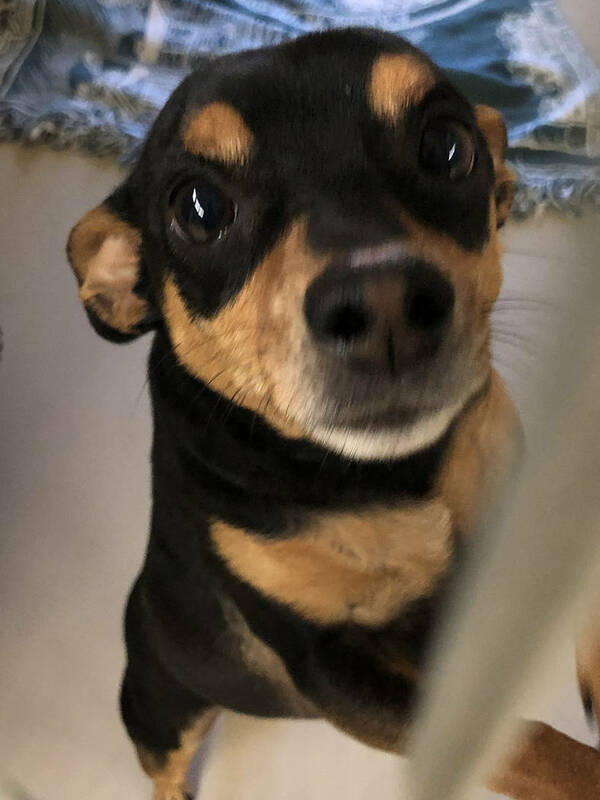 He is a neutered, 5-year-old, Miniature Pinscher. He is very friendly and house trained. For more information, call the Boulder City Animal Shelter at 702-293-9283. Boulder City’s new director of community development, Michael Mays, will be the guest speaker at the Boulder City Chapter of the Retired Public Employees of Nevada’s January’s meeting. The session will begin at 11 a.m. Thursday, Jan. 11, at The Homestead at Boulder City, 1401 Medical Park Drive. The Boulder City Republican Women’s Club will gather for its monthly luncheon meeting Thursday, Jan. 18, at the Railroad Pass, 2800 S. Boulder Highway, Henderson. Guest speakers will be Juan Martinez, state director for Americans for Prosperity, and Daniel Garza, president of the Libre Initiative. Doors will open at 11 a.m., and lunch will be served at 11:45 a.m. Cost is $21 per person. Reservations are required and must be made by noon Jan. 11. They can be obtained by calling 702-393-1228 or emailing bcgop@yahoo.com. Members of the Boulder City Branch, American Association of University Women, will hear about ways to improve their health at their meeting at 6 p.m. Monday. Guest speaker will be Mary Hinson, a personal trainer at the city’s community fitness center. Hinson is a certified personal trainer with the American Council on Exercise. She has a passion for the outdoors and fitness and believes the first step toward improving health and fitness is an active lifestyle. The meeting will be held in the museum meeting room at the Boulder Dam Hotel, 1305 Arizona St.
A collection of photographs by Ann Boulais are being featured this month in Boulder City Art Guild’s gallery inside the Boulder Dam Hotel, 1305 Arizona St. Her exhibit, “June, Monument Valley,” features black and white pictures of scenes and animals from national parks. An artist’s reception will be held from 1-3 p.m. Jan. 13. The gallery is open from 10 a.m. to 4 p.m. Monday through Saturday and from 10 a.m. to 3 p.m. Sunday. The Senior Center of Boulder City is launching a new craft show to help raise awareness of the center, its activities and services. The show, which debuts Jan. 20, will be held from 8 a.m. to 3 p.m. on the third Saturday of each month at the center, 813 Arizona St. There is space for 20 vendors. Organizers are still looking for those interested in participating. Cost is $20 for crafters and $40 for those offering services. In addition, pancakes will be sold, at $1 each, between 8-11 a.m. The first 25 attendees 17 and younger will be given a free pancake. Beverages will also be available. Admission to the Boulder City Craft Show is free. For more information, call 702-703-9429. A free handbell concert Jan. 13 will wrap up the two-day Twelfth Night Handbell Festival. The concert will begin at 4:30 p.m. at the Boulder City Recreation Center, 900 Arizona St.
Several authors will gather at Boulder City Library on Saturday, Jan. 20, for a special book signing event. Each of the four authors from Las Vegas who are attending will offer a 10-minute presentation on their book. The event is scheduled from 1-3 p.m. at the library, 701 Adams Blvd.